The 500th entry! Here goes! I recently put together a script to retrieve images from MMS messages sent from my phone to a special email address and have the images automatically added into my foga image gallery database. Said script has made all the images in this entry possible. The script combines the classes from Nameko and code to generate thumbs and throw them into my foga database. You can find all images sent from my phone this year here. Last Thursday I took my last final. It took a whole 15 minutes to finish. Oohhh Geography is so hard. Or.. not. By 13:20, Chelsea and I were on our way down to San Diego where we arrived at around 15:30. We went to Mike’s apartment where we hung out for the rest of the evening. We went to L&L Hawaiian Barbecue for dinner and returned to Mike’s apartment to spend the rest of the evening lounging. 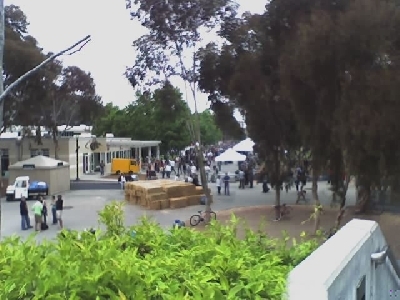 People at UCSD partying because of Sungod. Friday at around a bit after noontime Mike, Chelsea and went to the UCSD campus to mingle with others celebrating the Sungod weekend. At around 15:30 we met up with Raymond who had been late in meeting up with us because he got kicked off of a bus for hanging on the handle bars. We mingled with some of his colleagues and walked around the campus until around 17:00 when we left campus to go find food. 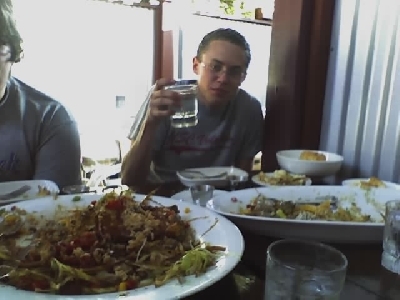 The plan was to go to a restaurant called Tokyo House in Pacific Beach, but we ended up going back to La Jolla and meeting up with Matt and Charlene (for they had magically appeared) and got dinner to go at Chipotle and ate it back at Raymond’s apartment. Tyson showed up. Raymond had a Sungod party planned and so we partied (and at some point Matt and Charlene left. ), and then people started arriving (in that order) and they partied, and there was mingling. Details omitted. At some point Chelsea, Myself then Mike ended up back at Mike’s apartment and we slept until noon on Saturday. Our empty plates at the deserts-only restaurant. After waking up Saturday morning, we headed back over to Raymond’s apartment and met up with Raymond and Tyson. The plan was to go restaurant hopping, so we did. 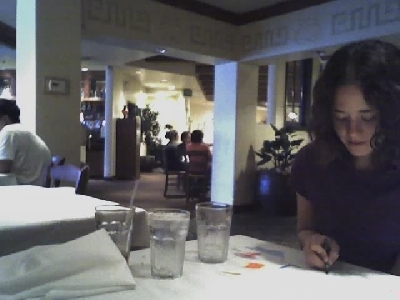 Our first stop, after some aimless driving around through Downtown San Diego, was a restaurant that serves only deserts. The chocolate all seemed to be of the Belgian type, and so I got a slice of Au Chocolat and a Danish. It was all rather very good, although I felt like I needed to die after eating my slice. 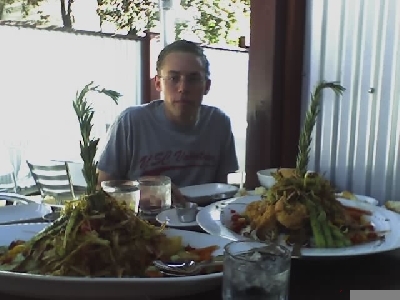 Tyson and the two dishes before being devoured. 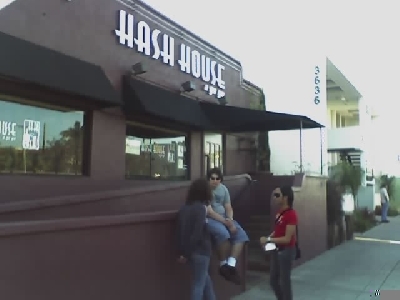 After the desert restaurant, and with Tyson high on sugar (as well as the rest of us), we marched down the street (in the Hillcrest area of San Diego) and went to a restaurant called The Hash House. This was around 17:00 and soon we had two large, large plates. One with Halibut and another with Eggplant and shrimp. It was all very, very good... And it must have been very good considering we had just eaten many deserts and were now eating again. The dishes both had these really good tasting asparagus. Mmmm I wanted more of those, but not really or I would have exploded. From here, the idea was to go to an Indian restaurant in Download San Diego, but this ended up not happening for we all felt like we were going to burst. Instead, we returned to Raymond’s apartment and hung around for a little while. Tyson passed out and slept, the rest of us chatted. 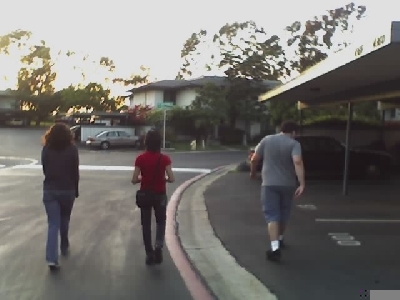 Chelsea, Raymond, and Mike walking straight towards Raymond's apartment. 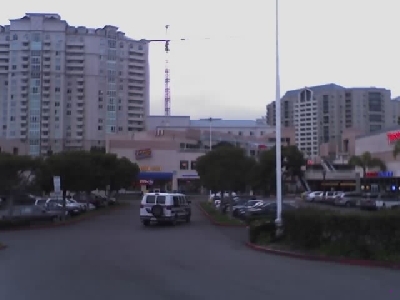 After some rest time, Raymond, Tyson, Chelsea, Mike and I went to go see Mission Impossible 3. An okay movie, until the end when I wished someones head had exploded. Oh well. We returned to Raymond’s place and soon Tyson left to head back home. One of Raymond’s roommates, Taty joined us and we went to Ralph’s for a past-midnight food run. We watched Serenity while picnicking on our Ralph’s snacks. I got milk. Mmm, milk. Eventually Mike, Chelsea, and I headed back to Mike’s place to sleep. We slept until 14:00 or something. Maybe it was 15:00. I don’t remember. Chelsea not included. Once we did get up, we all progressively took a shower and then we went to Aseops Tables, a really good Greek restaurant nearby Mike’s apartment. Mmmm. Greek food is yummy. We got a whole bunch of appetizers and it was delicious. Soon after heading back to Mike’s, Chelsea and I departed for the drive back to boring Camarillo. Hoorah. Camarillo. Not. Monday morning I slept through my alarm and was late for the Monday morning meeting at work. Now it’s Tuesday morning, and I’ve been here since 08:30 and now it’s only 10:30 and it feels like I’ve been here forever. Day two of my Summer spent at work. I need to ramble some more right here so that the picture over here --> doesn't get pushed down into the table of images below, so I guess this is me rambling and wasting some space. I suppose a better way to do this would be to just enter some breaking space, but I'd much rather ramble a bit. Hrm. It would appear as though I need just a little bit more to get everything to be just peachy. So I guess this is it. Lounging on Mike's couch Thursday evening. 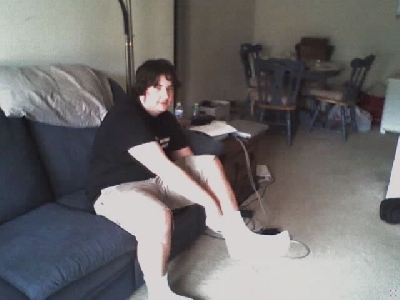 Mike and over-exposed socks in his apartment. 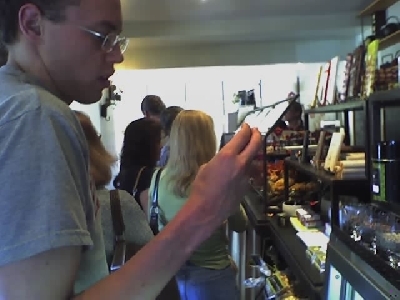 Tyson at the deserts-only restaurants waiting to order. 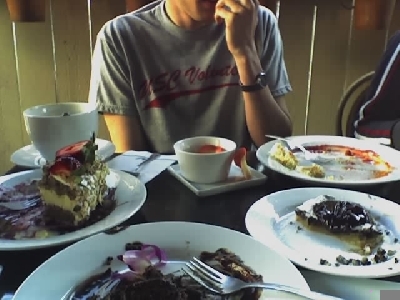 After devouring the two dishes we ordered at the Hash House. 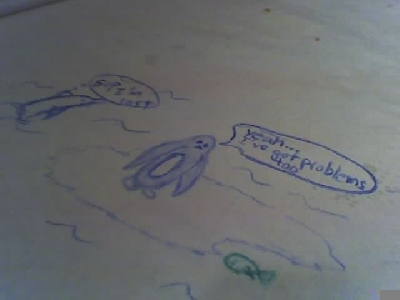 Mike's drawing at Aesops Tables. Vicinity of Aesops Tables Sunday evening. For all images from this trip click here. Well then.. Horrah for pictures. They make any weblog entry much more interesting. Last night I added the ability to add captions to any images that I take on my phone and send to foga. So, in all technicality I can now photo-blog. Or perhaps, Mobile-blog. Either way, expect such a section added to this site soon. I think that shall do it for this entry. The 500th! 500 entries since June 21st, 2001. A milestone, how neat. 500 is pretty cool Marco. You did a lot of lounging this weekend it seems from your pictures and captions. Tee hee, it was so fun. Can't say it's entirely original because I've seen photo-blogging on other sites.. What I've seen less frequently (or never) is the Mobile-phone photo-blogging. ... You copy-cat. You owe me now.. Come up with something that I can copy.